When it comes to wisdom, everybody agrees that King Solomon has always had the title pretty well sewn up, but this morning I stumbled across a verse in my Bible that frankly causes me to wonder. I Kings 10:22 says, "The king had a fleet of trading ships at sea…. Once every three years it returned, carrying gold, silver and ivory, and apes and baboons.” Okay, the gold, silver and ivory I can understand. But apes and baboons? I’ve been scratching my head over this one all day and the only thing I can come up with is that he must have taken one look at all those noisy, smelly, obnoxious primates and somehow convinced himself they were a "sure thing” – which just goes to show that, wise as he was, even Solomon could make a bad investment now and then. Believe it or not, I know just how he feels. Change "apes and baboons” to "Madame Alexander dolls” and it’s me all over. I remember how it all started. It was Christmas, 1963 and my two sisters and I each received a character from "Little Women.” Mine was Amy. Even though we weren’t allowed to play with them, I loved everything about those dolls, from the tops of their perfectly coiffed heads to the bottoms of their tiny black shoes. One day a friend of mine told me she’d heard that when the real Madame Alexander died, they were going to bury the molds of her dolls with her. Instantly, little Amy’s value sky-rocketed in my mind. Years later when I had a daughter of my own it gave me the perfect excuse to start buying Madame Alexander dolls myself. Unfortunately the only shop that sold them was really pricey, but that just made me even more desperate to scarf them up, you know, before it was too late. After all, Madame Alexander (whoever she was) certainly wasn’t getting any younger. She could kick the bucket at any moment and take her molds right along with her! The hardest part was persuading my husband that not only was there an extreme urgency here, there was also a potential for a HUGE return on this investment. (He says I claimed that the escalating value from those dolls would be enough for us to retire on, but I think that’s stretching it just a bit.) At any rate, over the next decade or so I "invested” in more than a dozen dolls. Fast-forward to today. Madame Alexander is, as my grandmother would say, "long dead” and obviously she went without her molds because somebody’s still cranking out those dolls as we speak. Not long ago I wondered aloud about the value of my collection, to which my husband replied, "An item is only worth what someone is willing to pay for it on EBay.” So I went online to check it out, and guess what. Those silly dolls are only going for about a third of what I originally paid for them. So much for our "retirement fund”. Am I alone on this one? I don’t think so. It’s human nature to want something that will grow more and more valuable the longer we hold onto it. The problem is, nothing on earth carries that kind of guarantee – not stocks, or real estate, or paintings, or baseball cards, or even (sorry, ladies) Beanie Babies! There’s just no such thing as a "sure thing”. Back when Solomon was first anointed king, God offered him anything he wanted, and he chose wisdom. God was so pleased with this choice that He blessed him with a wise and discerning heart. You know, something tells me that maybe Solomon knew exactly what he was doing with that shipment after all. If that’s the case, forget Madame Alexander dolls, from here on out I’m banking on wisdom instead. The way I see it, an investment like that is worth its weight in baboons! 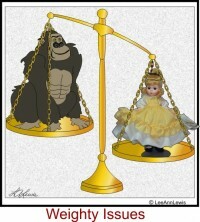 Search for Childlike Wisdom articles similar to "Monkey Business Sense. Search all articles similar to "Monkey Business Sense".